"We all go through this." Last night as I was working open studio at the BGCW studio, I was internally grumbling that the piece I was working on was not working out as I wanted. Another studio member walked by and commented on how great my pieces were turning out that night. Mike and I also spent quite awhile talking with one of the fairly new members about how much work it takes to really improve when you start pottering. And I was reminded, yet again, of what Ira Glass had to say about being creative. 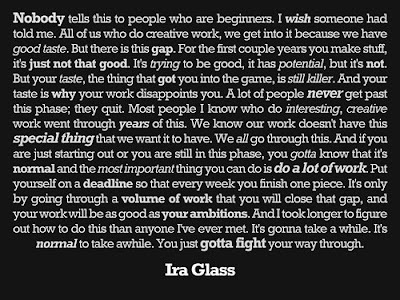 I find it so easy to give this advice and remind the new folks about this process, but often forget about it as I continue to work through that "gap" myself. That I have to struggle through the disconnect between what I'm actually making and what I want to create. And that it takes a lot of work to get even close to the perfect form that you can see in your head. The last time I ran across this bit of text by Ira--and of course, "I heard it on NPR"--it really had a huge effect on me and my pottery practice. It spurred to to make a conscious decision to put a lot my effort into my pottery, creating my little garage studio, and started this silly blog. And as I look back at the posts from last fall, I see that I was SO excited to bring home four mugs after a session at the studio. I'm still frustrated when I flop something, but it's hard to get really worked up when I can see that I've filled all my bats with new pots at the end of a studio session. And that I'm producing so much more and better work, with much less cursing and effort. And mostly, I'm pretty happy with what I create, despite the fact that I'm still reaching for more than what I can do now. What the heck is a yarn bowl, anyway? So, some people show off pictures of their kids, but lately I have been showing off pictures of my pottery. While I was proudly cooing with some dance friends over of photos of my shiny beer steins, one of them asked if I made yarn bowls that could be sold at the yarn store where she works. At the time, I didn't, but yarn bowls were on my list of new projects to try. And with the added impetus of a new place to sell them, I got to work. I fell down the rabbit hole of pinterest for a while, doing some research on yarn bowls. You see, I've knitted for a long time, but I've never used a yarn bowl. 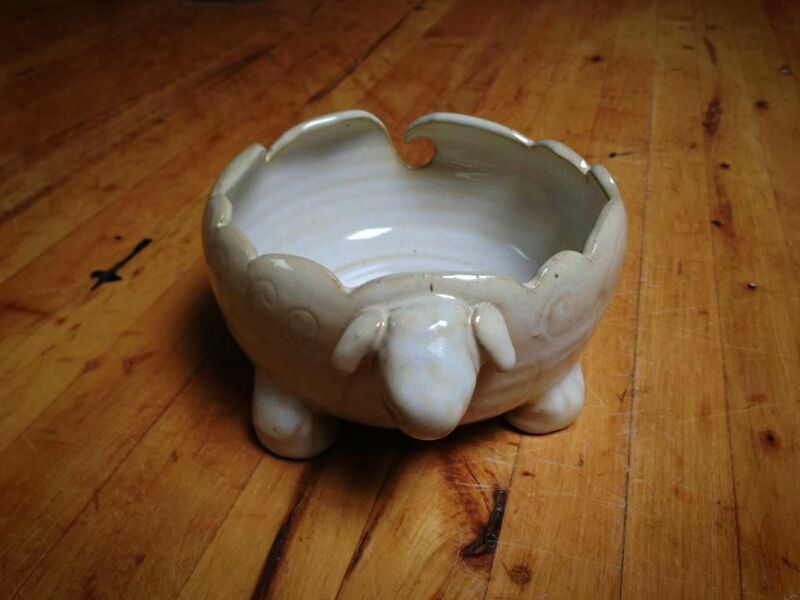 Luckily for me, the interwebs has every possible and fun kind of yarn bowl to use as a study guide. Yarn bowls are a way to keep a ball of yarn from rolling away from you as you knit, to keep them off the floor, and to keep kitties from losing their minds and making a knotted mess of your yarn. There are different styles of yarn bowls, but ideally they have a some sort of guide for the yarn to pull out of the bowl while the ball rolls around inside. I threw several test bowls and they mostly worked. Some a little too small, but still functional. The next batch included an awesome sheep yarn bowl! When I was up to a half dozen decent examples, I schlepped them down to the Starstruck Cat Studio to see if my friend Heather would like them at the shop. And woohoo! Some of them sold that weekend. Yay! Then the clay gods were angry with me for a while. To my despair, I had a run of flopped bowls, bowls that cracked during trimming (invariably with the very last bit of carving), breaking them as I brought them to be fired, cracks during the bisque, legs popping off sheep bowls, and bad glaze incidents. It was demoralizing. Sigh. But, the clay gods have finally smiled down on me again and I can show off some new beauties!